We’ve got fantastic news for lovers of HelloFresh and fine wine. This renowned meal kit delivery service has announced the launching of its very own wine club, set for May 17, 2017. After delighting its customers with the beginning of what is to be a series of exciting food-and-drink events called FreshMeets, it is bringing even more joy to its fans by expanding its offer. 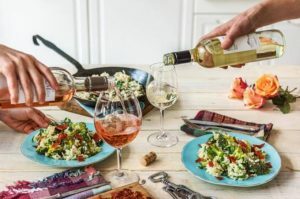 Following in the footsteps of one of its greatest competitors, Blue Apron, Hello Fresh has decided to help you easily make your meals complete by allowing you to subscribe to its brand new wine club and receive fine wine at a great price. With the launch date just around the corner, let’s take a quick look at the freshest addition to the Hello Fresh family. Hello Fresh is known for turning meal planning and cooking into sheer fun, with easy-to-follow recipes and high-quality pre-portioned ingredients that make every dish shine. Thanks to the pairing suggestions it is about to introduce, now you’ll be able to know exactly which wine goes best with your culinary masterpiece and order it straight from the Hello Fresh website. It’s simple, convenient, and affordable. Good wine does not require an occasion, it creates it. Hello Fresh promises to bring you wines that can instantly turn any evening into what you want it to be. From romantic dinners and get-togethers to extravagant parties, there is nothing you cannot organize and make better with fine wine. Hello Fresh is here to make your wine shopping easier than ever. It even aims to offer some light wine education, with flavor profiles and tasting notes that are to accompany every bottle. As usual, the company aims to please, which is why it lets you pick the kind of wine you want to receive. Every order will contain 6 full-size 750ml bottles of wine. The options at your disposal are all reds, all whites, and mixed. The deliveries will be made monthly and the set price is $89.00 plus taxes. The shipping is included in the price. Membership in the Hello Fresh wine club is going to be rather flexible. It is designed to provide you with the chance to order wines even if you are not purchasing the company’s meal kits and you also get to choose the delivery day that suits you best. If you are not a big fan of commitments, you might be happy to know that you get to pause or cancel your subscription at any time, without any penalties. According to Stacy Gordon, HelloFresh US Chief Product Officer, this new option is meant to be „another way to not only simplify home cooking but make it fun.“ Being familiar with Hello Fresh’s work so far, we are sure it won’t disappoint. If you haven’t used the services of this excellent company yet, now is a great time to start. HelloFresh provides you with incredibly fresh ingredients and easy-to-follow recipes, helping you create tasty, home-cooked dishes without all the hassle of having to shop and plan. Find out more about this famous meal kit delivery service in our objective HelloFresh review.